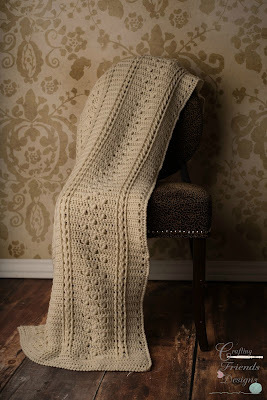 Over the first few weeks of April, I held a Mystery Crochet-A-Long for my new afghan design. I've really enjoyed seeing all the WIP photos that everyone has posted on Ravelry and in my Facebook group! It's always fun to see the colors that others choose to use and how they turn out. I'm thrilled to finally be able to show you the entire Braided Cable Block collection! My nephew will be getting married next week and I wanted to design something specifically for them. I wanted clean, classic, elegant and something meaningful that they will both appreciate. I chose to use Deborah Norville Everyday yarn in an off white for that reason. I love the way the braids just flow with this color and the yarn itself is soft and is anti-pilling which is great. The Braided Cable Block Throw will add warmth and texture to any room. This pattern is written so you can easily work it to your own desired size. Easy and quick to work up, you could make a small one for Baby Shower gifts, throw size to place on a rocking chair or large enough to cover a king size bed. 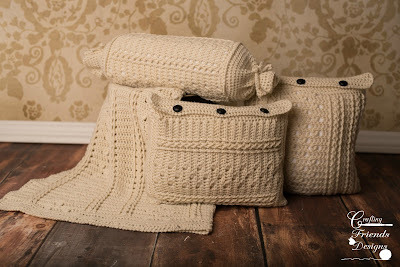 The Braided Cable Block Bolster Pillow cover is open on both ends for easy removal allowing you to switch out colors and styles for any room. This design is worked around the pillow and closes with ties. 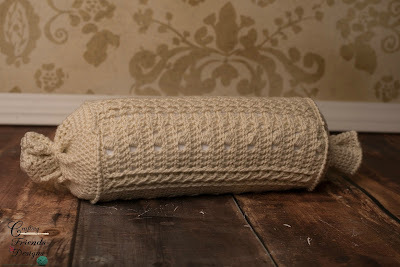 It also includes instructions for making your own pillow base if you don't already have a bolster pillow. The Braided Cable Block Square Pillow cover is worked from the bottom up and closes with a flap and 3 buttons for easy removal. 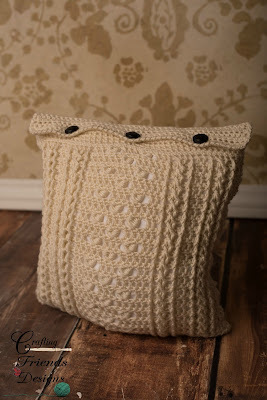 This pattern includes instructions for making your own pillow base also. 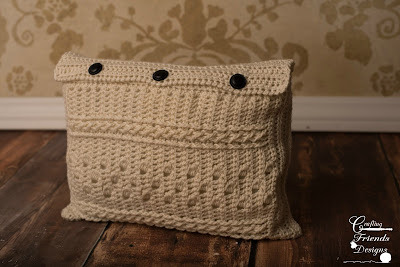 The Braided Cable Block Rectangle Pillow cover is worked from side to side allowing the cables to run the length of the pillow. Closing along the length with 3 buttons allows for easy removal and cleaning. This pattern includes instructions for making your own pillow base too. Whether you're making this set as a gift or spoiling yourself and making it for your own home, it's sure to be enjoyed! Now through May 2, 2017 you can enjoy 50% off all individual patterns or $5 off the full collection on Ravelry. No codes needed. 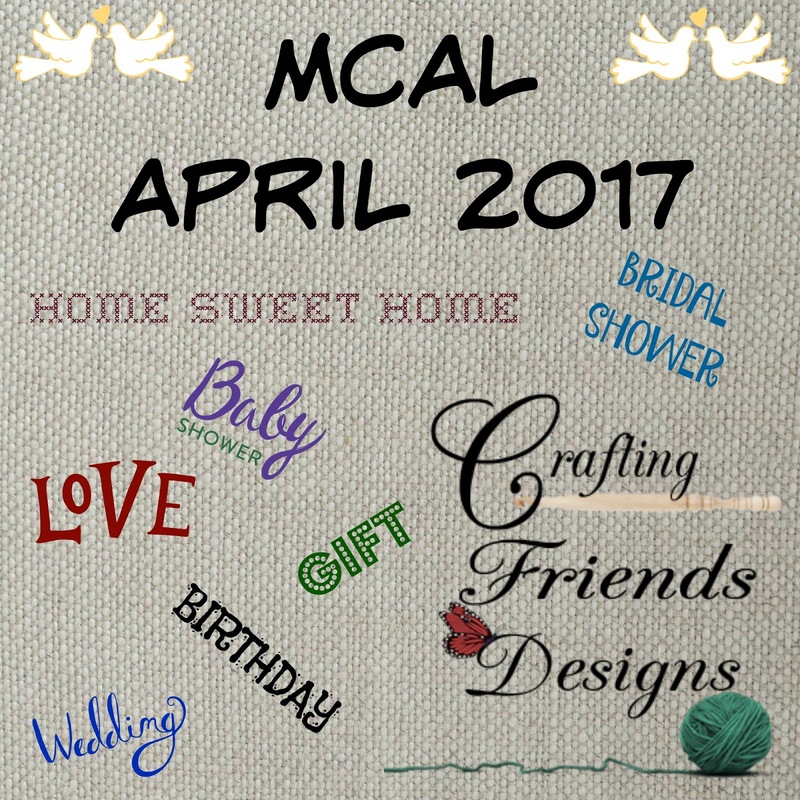 Come join our Mystery Crochet-A-Long for April! Are you ready for a Mystery Crochet-A-Long? I'ts been a while since we've crocheted together! 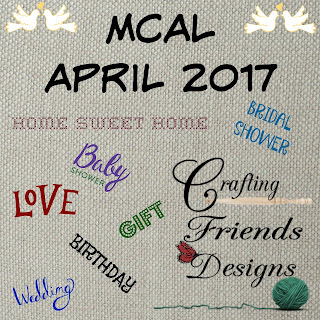 I am just finishing up another beautiful home decor collection and thought it would be fun to do a crochet along with all of you. I can't tell you to much about the design or it would take the mystery out of it...BUT...I think you'll love it.